PRINCE2 2009. Risk part 9. 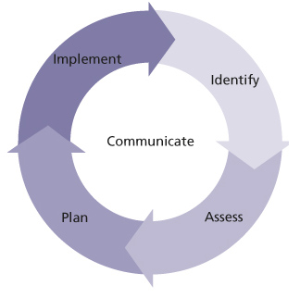 The first four steps are sequential, with the ‘Communicate’ step running in parallel because the findings of any of the other steps may need to be communicated prior to the completion of the overall process. All of the steps are iterative in nature in that when additional information becomes available, it is often necessary to revisit earlier steps and carry them out again to achieve the most effective result.